Your waterfront decking in Harford County can be this beautiful! So much of beautiful Harford County sits on the water – from Edgewood to Belcamp to Havre de Grace -the county is replete with waterfront homes. If you own waterfront property in Harford County, there’s a pretty good chance you own it for one reason – it’s waterfront property! Homes on the water tend to sell for more money than dry lot homes, and of course the opportunities for fun and excitement are greatly multiplied, given the fishing, the crabbing, the boating, the swimming and, oh yeah, the view! But wait! Your deck railings are blocking your beautiful view! Fortunately, there is an easy way to fix that: Waterfront Decking. When we talk about waterfront decking, the only real difference between it and traditional decking is the railings. 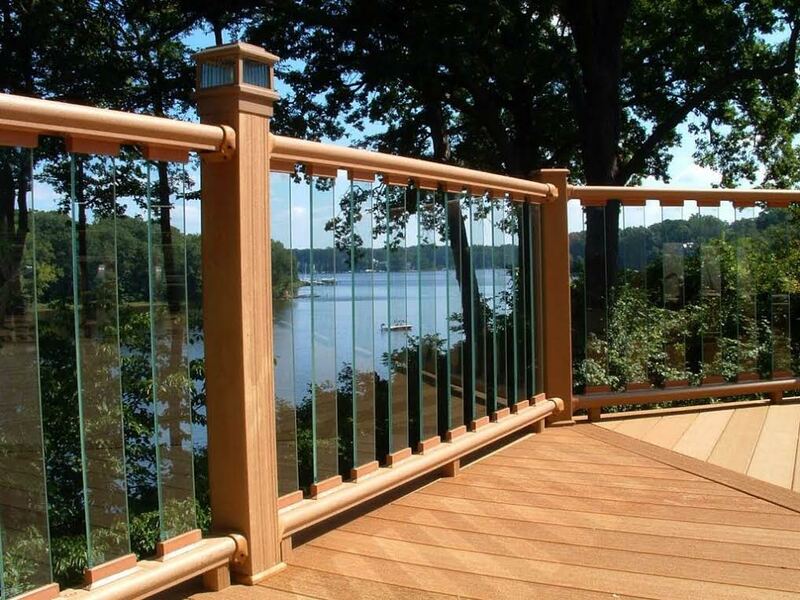 The body of the deck is constructed the same way you are used to, using the same high-quality wood or composite (recommended for waterfront homes) materials, but the railings are made of either long lasting aluminum alloy posts with tempered glass panels, stainless steel cable, or aluminum pickets. Why? These options provide the same safety benefits as traditional railings, but they will not block your view. That’s what we like to call a win-win. Durability: These railing systems will stand up to salt without corroding, which is important if you live near salt water. Curb Appeal: These railing systems add instant curb appeal to your waterfront property. With 40 years of experience, Freedom Fence and Home has provided the highest quality fence and decking services to its many residential and commercial clients throughout Maryland. Our crews are highly trained and ready to help. Freedom Fence and home has successfully completed hundreds of waterfront decking jobs throughout Harford County. Our waterfront decking options are perfect for new construction, retrofits, or remodels. When you contact Freedom Fence and Home about our waterfront decking services, you’ll speak with a knowledgeable employee who can answer your questions and schedule an appointment. Next, we will send one of our experts to your home to discuss your options, and provide you with insight and guidance. Then comes the installation and your new (or retrofitted) deck. If you have any questions about Waterfront Decking in Harford County, please contact Freedom Fence and Home by calling 443-271-6841 or visit our website. You can also follow us on Facebook and Twitter! This entry was posted on Tuesday, December 8th, 2015	at 5:24 pm	. Both comments and pings are currently closed.